Artists share how they set up their own VFX studios, and give tips for anyone wanting to do the same. Like any adventure in life, there is no right or wrong way to embark upon setting up your own VFX studio. But to see how others have done it, we spoke to several people who have set up on their own in the world of 3D movies. Read on to discover their hints and tips and experiences, and prepare to be inspired, regardless of where you are in your career. There's no question that the majority of VFX studios are born when one or more senior artists depart an established studio in order to set out on their own. This is exactly how Milk VFX came about in June 2013. CEO Will Cohen explains: "When The Mill took the decision to close the Film & TV department, a small group of us seized the unique opportunity to set up on our own." Milk got started in London with just 40 people and three key projects, Sherlock series three, Doctor Who's 50th anniversary episode, and a TV adaptation of Jonathan Strange & Mr Norrell. From there it has grown into a studio famed for its work across high-end film and television projects. Within four years, the team had gradually grown to 150 people, and opened a second small studio in Cardiff, Wales. Today it has 250 artists onboard, and has also just announced a third studio space in Fitzrovia, London. When asked how the studio was able to establish such a sturdy reputation in the heart of the industry, Cohen puts it all down to the team's combined experience. "We were very fortunate with the contacts and track record we had between us. And then, the work we were able to secure helped us build our reputation for high quality. We went on to win our first BAFTA Television Craft Award for Doctor Who: Day of the Doctor – which was like a fairytale for us." There's the small matter of reaching the end of your first year with money in the bank, which is a make-or-break time for any new business. "We were a self-funded enterprise, we didn’t start with millions of pounds," explains Cohen. "Two key decisions helped us: investing money and energy in branding Milk properly when we set up and later (in 2017) taking on the investment from the BGF and deciding to grow the business with a proper strategy." Cohen also states that ensuring the technical scalability of the business was also a crucial factor in their early success, particularly their investment in cloud technology. It was a slightly different journey for Alexis Haggar when he founded his VFX studio Lexhag in 2009. "Up until that point, I'd graduated from film school and landed in the special effects industry," he explains. "It was around the time that CGI was becoming more mainstream, no longer a luxury but a necessity for many productions. Regularly we'd talk about how CG would take over the FX industry altogether. At school, I had created my Art A-Level final piece in 3D animation, so I was kind of already up to speed with some of the professional software." Haggar continued to progress his career in SFX until he met Paul McGuinness, a BBC visual effects veteran known for work across practical and digital effects. "I worked with him for a few years, gaining lots of knowledge and experience in both areas and shortly after a brilliant stint of work with him, I decided it was time to set up Lexhag," says Haggar. From there he spent the entirety of his savings on the rental of a small basement in Soho. The rest, as they say, is history. Despite not having a wealth of experience in the VFX industry, Haggar maintains that his combined experience gave him a unique edge. "If anything, I had more of a round view of the industry. My journey was about knowing the filmmakers and working with them to create their visions." 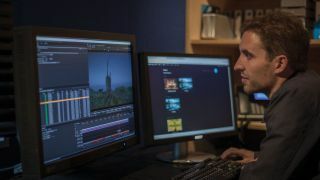 "Obviously, knowing how to produce VFX shots and having a reliable core skill is also essential, and when you win your first job you'll more than likely be hiring others to work with you, and building a team." Early on Lexhag's reputation was built on projects that combined practical and digital effects, as well as Haggar's keen interest in the horror genre. It was this that led it to work on their first television series, Charlie Brooker's Dead Set. He continues: "It's a hugely competitive market, so anything that makes you stand out is good. Having a niche and doing something very well, that you can repeat, means you can create a more sustainable business." The unfortunate side effect of having a niche is becoming pigeonholed, something Lexhag combat by consistently learning and experimenting with new techniques or technologies. "We're a creative problem-solving company, solving story-driven challenges. Our team is multi-skilled and we love using all our skills to create; we make CGI, we shoot elements, make equipment, we prototype physical ideas, 3D print and develop props, help design sets, build characters, design camera rigs and loads more," states Haggar. For those considering a venture similar to Haggar's, he has some sage advice: "It's hard work and you have to work smart. Be prepared to do a bit of everything, not just what you love. You'll need to be the type of person that can focus their efforts, and enjoy all aspects of running a business." "As boring as it sounds, having a good accounts system and delivery pipeline will be paramount to the success of your studio and most important of all, looking after your people." For owner of Pariah Studios (and the editor of 3D World) Rob Redman, it wasn't necessary to go all in with his life savings. "I was a photographer for years and I was doing a lot of image editing, which then developed into 3D," he explains. "I started Pariah Studios as a freelance, 'on-the-side' thing. It didn’t become a limited company for years, but I started building up." Redman asserts that he enjoyed the creative freedom that this kind of organic growth allowed. "I had design and 3D and camera work all running together," he adds. Early on in the life of any studio, the freedom to pick and choose projects is going to be an unaffordable luxury. As Redman explains: "At first you don’t have a reputation, or if you do it’s within someone else’s company." "You won’t get much coming in to start with, so you take it all, it's only when you start getting more that you can pick and choose. Don't forget that in another couple of years, you've got to budget for newer gear and faster computers." Cohen believes that experience and location are important to setting up a successful studio: "We found when we started that people really want to know who you are and what you’ve done, so that experience is crucial." He adds: "Location is extremely important in terms of talent pools and clients. Especially with London – though things have shifted a little over the last couple of years, there is a significant pool of talent in Soho/ Fitzrovia and it is, of course, the traditional film business location for clients and is still where they like to be – enabling them to walk around to the various companies." Despite having some clear advantages, there's always hurdles for any fledgling studio to clear. Cohen explains that convincing potential clients that they could handle large-scale jobs was one of the biggest challenges initially. "Keeping the order book full at the same time as keeping an eye on the jobs we are doing is still a challenge today," he adds. For Redman and Haggar, location is less of a concern in the contemporary VFX industry. "These days, remote working is common and many people work from around the globe. If you're based in the UK, Soho still has its benefits, but for how long, I'm not sure," states Haggar. According to Redman: "You can be in a log cabin in the woods somewhere, as long as you've got an internet connection and you stay part of the community, it doesn't matter." The means to start your own studio are now more readily accessible than ever, but that doesn't mean it's any easier. "It's easier to set up, but harder to succeed," says Redman. "As it becomes more widespread, you'll have 300 people trying to do the same thing that only ten people were doing a decade ago." With the insight of our experienced contributors, plus enough drive and creativity, you may have what it takes to set up your own VFX studio, so why not go and find out? This article was originally published in issue 237 of 3D World, the world's best-selling magazine for CG artists. Subscribe to 3D World here.